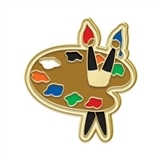 Find unique and stylish music-themed brooches and lapel pins. Be sure to check out our large selection of Instrument & Achievement Pins too. Click Here to view our huge selection of Instrument Pins and Achievement Pins.